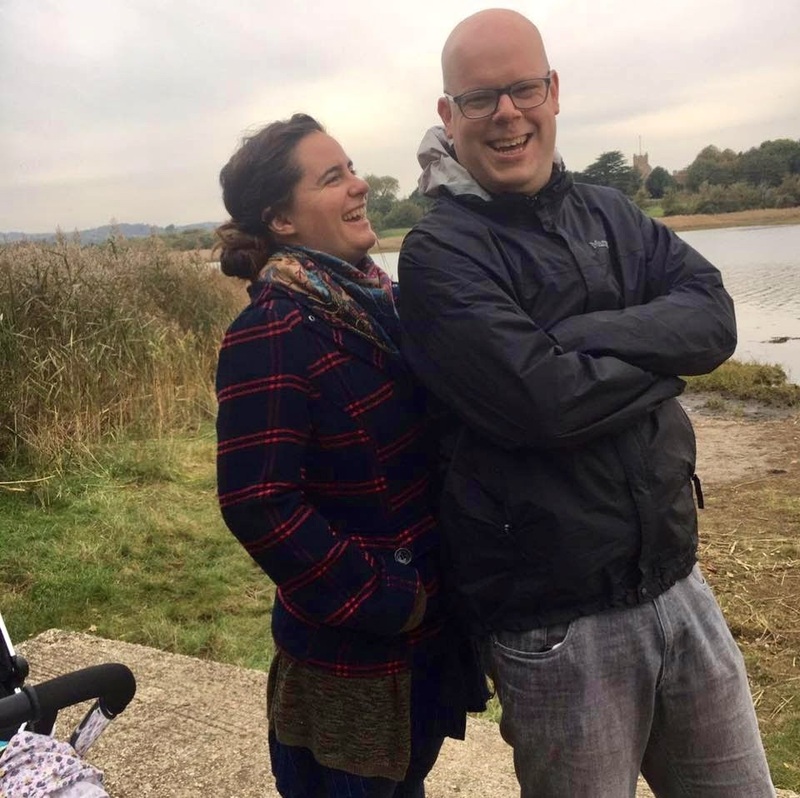 It’s just over a month until a load of us head off to the Wildfires Festival, and I wanted to both update you on what is being planned, and encourage anyone not yet booked in to book in before the early bird rate ends this Sunday. If you are going to book in be sure to do it via the Kerith specific booking site to new sure that you get to camp with the rest of us! Wildfires is an opportunity for us to spend time together as a community with a bunch of other like minded churches, not only to have an amazing time together but to contend for revival in our nation. Below are a few things I thought you might be interested to know. Our village: So far we’ve got around 80 people from Kerith registered to go. We’ve got our our own ‘village’ where we all get to camp together, with a village tent which will seat up to 200 people for us to gather in, eat in and do whatever else we want. Anyone with a caravan or hiring a tent will be in an area very close to our village. Apparently our village will also have its own fire pit - I can’t tell you how excited I am about that! Day visitors: I know for some people the idea of camping is a complete non starter! If that’s you why not come down for one day as a day visitor, or find an Airbnb or somewhere else to stay nearby. You can book day tickets here. Timings: The festival runs from 9.30am on the Monday to late on the Wednesday evening, and will finish with a bonfire and a free hog roast for everyone. I’d encourage people to also come to the Big Church Day Out on the Saturday and Sunday before Wildfires which is included in the cost of your Wildfires registration, but if you can’t make that ideally you’ll want to get there on the Sunday and stay until the Thursday morning to get the full experience. Labs: There will be interactive seminars every afternoon on subjects such as Leadership (with Nicky and Pippa Gumbell from HTB), Spirituality (including moving in the prophetic with Julian and Katia Adams), Relationships (including Nicky and Cilla Lee of Marriage Course fame), the Big Issues in Society and Hearing Stories (including amazing stories on the growth of the church in Persia). Contributors: As well as the people mentioned above other people involved in the festival include Christy Wimber, Pete Greig, Lucy Peppiatt, Tim Hughes, Martin Smith and others. You can find a full list here. Kids and Youth: A big focus for the event is creating spaces where our children and youth can powerfully meet with God. Many of us will have stories of how God met with us as youngsters at events just like this. If you have children in those age groups please see this as an opportunity to make a big investment in them. You have no idea what God might do! Revision: I realise that there will be families with teenagers who have exams coming up who will be wondering whether to go. Wiston House, which is the stately home on the site, will be used as a revision space for the young people who have exams. There will be teachers there, along with people to pray for them whilst they revise (open from 1pm – 5pm all three days). Bursaries: We don’t want lack of finances to be a barrier to anyone coming. 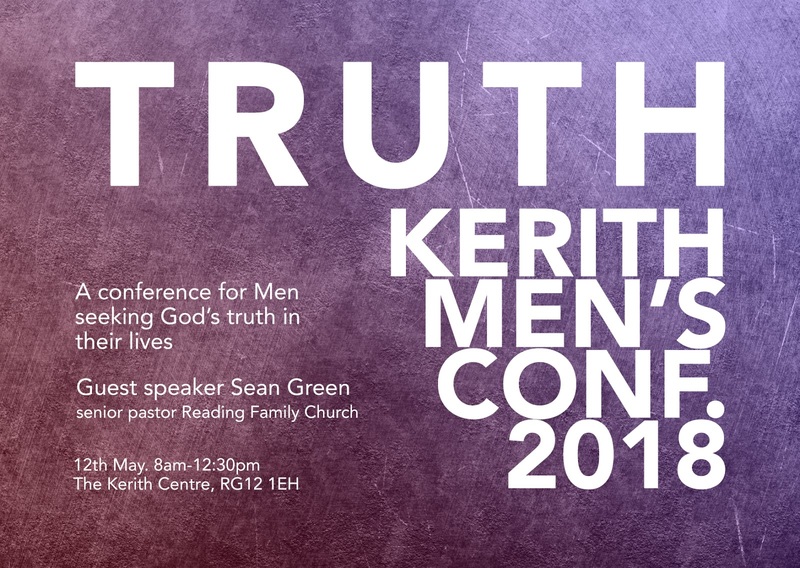 Some very generous people within Kerith have already offered to help fund people who might not otherwise be able to go - if that’s you then I’m very grateful. If you too would like to help pay for someone else then please contact Sarah Harvey. If finances are an issue for you in terms of coming then please contact also Sarah who will help collate requests for help and try to make sure everyone who wants to go cam get there. Facebook: We’re going to set up a Facebook page so that everyone going from Kerith can keep in touch and ask questions. Once it’s up and running I’ll let you know where it is! If you’re not currently booked in I hope that’s encouraged you to come. If so book in here before Sunday to make sure to get the early bird rate. And if you do have any questions please contact the amazing Sarah Harvey who is our group coordinator. 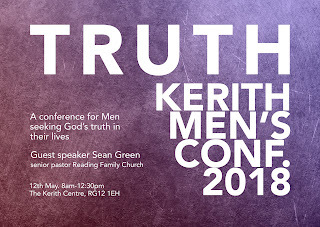 I want to invite all the men of Kerith Community Church (and any other men who fancy coming along) to our TRUTH Men’s Conference on Saturday May 12th 2018. Matt Ranger, who is leading the event, assures me there won’t be any fluffy decorations, scented giveaways, or beating around the bush. Just a great does of life giving TRUTH, and a bunch of guys wanting to cheer one another on. Tickets are a very reasonable £10. I just bought mine, you can get yours here.